Apparently plastic bags are a resourceful means to collect morning dew and many mountaineers use it to collect water. Needless to say, not all climbers are conscientious enough to carry back their litter, and as a result many of our peaks are getting polluted. To offer a better alternative, we have here the Succulent Concept, a mock up of a succulent plants. 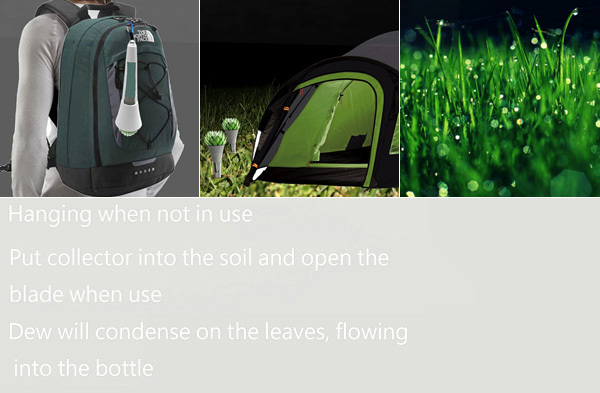 It helps collect and filter in the morning dew, directly into a bottle and is easily portable. The Succulent is a 2011 Liteon Award entry. via Liteon Succulent Concept by Yu-ru Chen » Yanko Design.